Seeing all the elements of Melissa's bedroom come together in yesterday's Phone-A-Friend, made me want to redecorate my bedroom entirely! Bravo Melissa on choosing a terrific inspiration photo! This past weekend The Qs were in town (Jeff's parents) and Mrs. Q inspired me to make some roman shades for our office. We had been discussing it for a while and I found some directions online that Mrs. Q thought were easy to follow (she happens to be a master sewer, we're talking black belt). So on Saturday we hit the fabric store and hardware store, and while the men watched football we made roman shades. I realize how gendered that sounds, but in 800 sq feet of apartment, we were still all on top of eachother and hanging out. I'm SUPER pleased with how they came out. But per usual, the photos are really dark (I MUST get a new camera). We made two of the four together and I'm hoping to make the other two this weekend. I can't thank Mrs. Q enough, she's not only a great sewer, but a great teacher as well and was very patient with me. Together we have about 40 years of experience sewing, but 39 of them are hers. 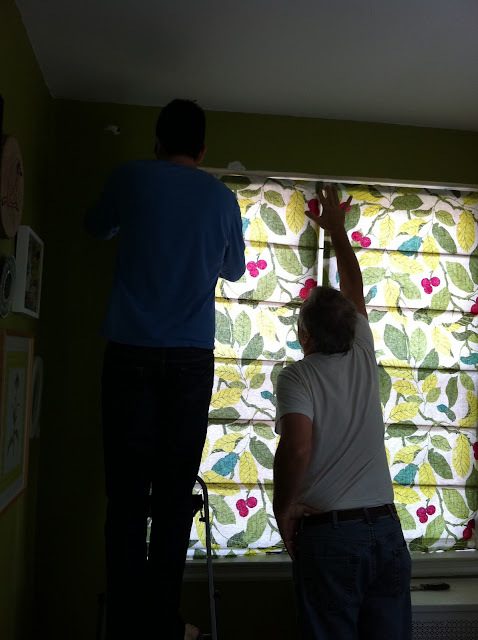 The men helping us hang the shades. As you can see, we repurposed the drapes that were already in the office. I love the panels, but I think this tiny room is better suited for something a little more casual like roman shades. As if The Qs hadn't helped out enough already, they gave us the ikea curtains too. They used to be in their dining room! We obviously have some plaster repairs to make. Note to self: Avoid living on the top floor of pre-war buildings in years that experience an earthquake and a hurricane in the same month. No bueno. I'll try to take better photos when I get the other shades up, but what do you think so far? GAHH - I have been searching for Roman Blinds for the nursery. The window is a really odd size and I can't find any that would fit and aren't $500. Hmm....wonder if I could attempt this. Looks great! Good work Qs!